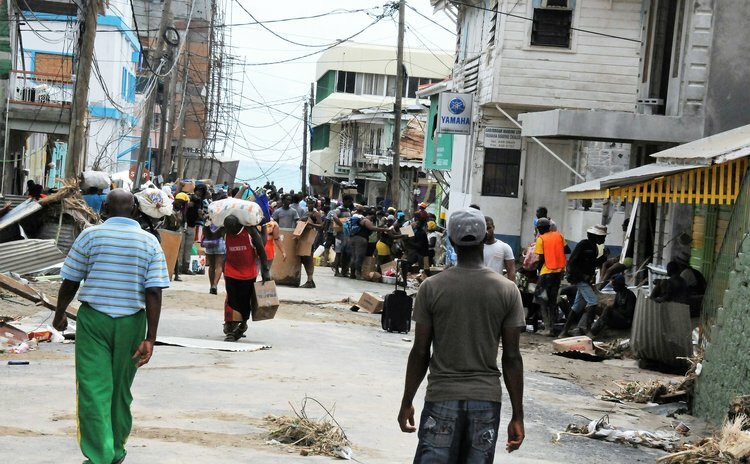 Daniel Carbon, the Police Commissioner and the Government of Dominica have supplied their side of the story in the Hurricane Maria looting suit filed by six businesses in Roseau in April 2018. The six businesses, and many others, were mercilessly looted for several days after Hurricane Maria and have filed a lawsuit for breach of statutory duty and negligence against the police, the minister of justice and the attorney general. In their defense, the defendants say the matter ought to be struck out and furthermore, the law does not provide for compensation for "loss including theft following a riot, civil commotion, strife or civil disobedience." Additionally, they contend that the law of negligence does not impose a duty on the police "to protect private individuals or property in the midst of or during" events like Hurricane Maria and, in addition, the Police Act does not legally command the police to protect private property during events like hurricanes. When the businesses filed their claim in court, they also failed to consider the destructiveness of Hurricane Maria, the document stated. "The implied allegation in paragraph 12 that Government had a responsibility to man and resource the Force to meet the savage and unprecedented destruction of a Category 5 Hurricane, such as Maria, is manifestly unreasonable and is denied," the defence has stated. According to the defence filed by the office of the Attorney General, Hurricane Maria also destroyed police facilities. "For example, significant damage was caused to the Morne Bruce barracks, buildings, infrastructure, Police stations, Police and island wide communications etc., "the defense stated. "Police communications were completely lost for a number of days. The Police Headquarters in Roseau was flooded, and entry and exit made difficult because of the flooding and debris. The road from the barracks at Morne Bruce was blocked preventing the passage of vehicles. Officers called in sick or were seeking to secure their homes and families, lives were lost and persons were missing which required officers available to be deployed on search and rescue missions". In their suit the businesses said looters stole goods valued at more than $2.2 million. Provide the detailed proof, say the lawyers for the Police Commissioner and the minister of justice. Earlier, the businesses argued in the suit that the wanton and widespread looting was caused by negligence of the police and by extension the minister of justice. But the defendants contend in the document that "the civil commotion, violence and threats of violence and riotous behavior, and theft and malicious damage were directly caused by the Hurricane Maria and its aftermath and consequences". Roseau was in an extremely devastated state with roads and vehicular access blocked. In addition, the defence maintains that initially the police had to "deal with a crowd of approximately 800" who "appeared armed and/ or acting threateningly in the streets of Roseau". "The crowd had entered and assembled in the City of Roseau in the wee hours of the morning while winds were still blowing. Their numbers and aggression grew in the course of the morning", the defence document said. "Despite several attempts to secure properties in Roseau and its vicinity, the Officers could not disperse the crowds who were at times threatening officers, and acting violently. This required certain Officers to fire ammunition over the heads of the crowds. In the absence of a threat to life or limb the Officers had no authority to shoot individuals". "The Third Defendant (the Attorney General) avers that in the circumstances which prevailed after Maria and which exist currently, a Commission was not and is not warranted or in the public interest. It is further averred that in the circumstances there was no legal or other obligation on the Government to make or offer compensation in the circumstances of this matter".